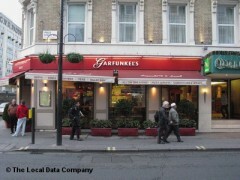 About: Garfunkel's offers a wide variety of American style food such as pizzas and burgers as well as a wide selection of pasta and various salads. Popular with all the family. OK so this is a chain - but this one's a good as any. You know what you're getting - american-style diner lunches and breakfasts. Clean tables and booths, friendly staff. This one is bolted on to the Mercure hotel next door.